Try, if only for a moment, to envision a scenario in which you could still be completely surprised by a rock band. It’s not easy. In fact, it’s increasingly rare. Hailing from Devon and based in Bristol, U.K., Spectres are a noise rock quartet combining elements of shoegaze, drone, indie rock, and, to some extent, post-punk. Made up of vocalist/guitarist Joe Hatt, guitarist Adrian Dutt, bassist Darren Frost, and drummer Andy Came, the group’s ascent to widespread critical acclaim both on record and on the stage began after they had started to dominate the U.K. gig circuit. The outfit’s first foray into the public eye was with the 2011 EP Family. The release cemented their penchant for harsh noise and uncomfortable swathes of distortion, enveloping somewhat straightforward, albeit dark, melancholy pop songs. It was this sound that began to earn the band comparisons to pioneering noise acts such as My Bloody Valentine and The Jesus & Mary Chain. This led to Artrocker magazine crowning them “Unsigned Band of the Year,” a title that spurred on more activity for Spectres as they took up residence in a makeshift bedroom recording studio to record their next EP, the highly visceral Hunger, which was put out by the group’s own label, Howling Owl Records. Following this, the band went on scheduling more performances around the country, eventually deciding to relocate from Devon to Bristol. It proved to be a bold move, as the ensemble increased activities with Howling Owl, promoting the likes of Wilde, Towns, and the Naturals. A significant change came for the group when esteemed independent label Sonic Cathedral asked them to support Lorelle Meets the Obsolete on a nationwide tour, eventually landing Spectres a spot on the label roster. Further success followed when they released their debut album, Dying, in 2015, an effort that gained further comparisons to acts such as Sonic Youth and A Place to Bury Strangers. 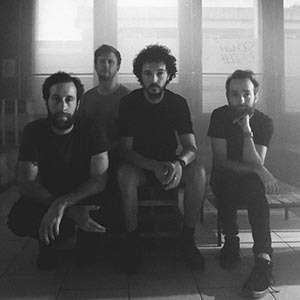 Spectres kept busy throughout 2015 with more gigs and followed up their debut with a collection of remixes entitled Dead, which boasted reworkings from the likes of Mogwai’s Stuart Braithwaite and Ride’s Andy Bell. They returned in early 2017 with their second record, Condition. Recorded by Dominic Mitchison and mastered by Frank Arkwright (Mogwai, 65daysofstatic) at Abbey Road, the album was a devastating assault of overloaded guitars, harsh textures, and sonic experimentalism.